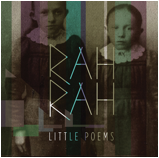 Delightful Regina indie pop outfit Rah Rah are coming back with a couple of releases. The first is the vinyl 7" "Little Poems". The track is backed by "I Could Tell You I'm Sorry". The band will also be releasing their third full length album, The Poet's Dead, in the fall. Rah Rah play The Dakota Tavern in Toronto on June 15th as part of NXNE.